Over the past year, the WEDA Legislative Committee has been focused on developing the organization’s legislative agenda for the 2019-20 legislative session. With tremendous input from members from across the state, the 2019-20 WEDA Legislative Agenda was finalized and officially released earlier this month. The Legislative Agenda provides a broad policy vision for advancing economic prosperity in Wisconsin and includes WEDA’s specific legislative priorities for the upcoming session that fall into one of the following issue categories: Effective Financial Incentives; Advance Workforce Development; Competitive Business Climate; and Robust Infrastructure. Increase from 12 percent to 18 percent the limit on the amount of taxable property permitted to be within a municipality’s existing TID or TIDs at the time a new TID is created. Allow small municipalities to have up to three TIDs regardless of the statutory TIF percentage limit. Many of these communities exceed the TIF limit with one or two TIDs due the small amount of equalized value within their borders. Support comprehensive legislation to provide financial resources and new economic development tools to smaller communities and rural areas of the state to advance economic revitalization and growth. Require the state’s Transportation Economic Assistance program to provide grant funding for projects that retain jobs, not just those that create jobs. In the current economic environment, job retention is just as important as job creation. Preserve the State Trust Fund Loan program in its current form. The program is one of the largest public investors in economic development projects in Wisconsin, investing over $1 billion over the last decade. Create a state Opportunity Zone program that mirrors the Federal Opportunity Zone program to more effectively leverage long-term investments in communities across Wisconsin. Create the Earned In-State Tuition Incentive program to encourage, through financial incentives, out-of-state students who attend college in Wisconisn to stay in the state to live and work after graduation. Create a talent attraction incentive program to provide individuals who move to Wisconsin to live and work with grant payments to help offset housing costs. Create a sales tax exemption for building equipment and supplies used in workforce housing development projects. Increase the current TIF “housing improvement extension,” which allows a municipality to extend the life of a TIF and use the increment to improve housing stock within the community, from one year to two years. Support legislation to close the “Dark Store” property tax loophole in Wisconsin. Preserve WEDC as the state’s economic development agency and maintain the agency’s economic development programs that have advanced growth across the state. Support a reliable, yet reasonable funding source for the maintenance and future development of a modern, statewide transportation network. 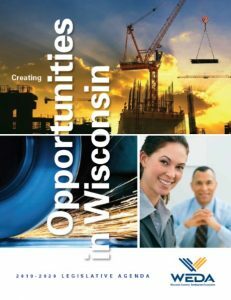 WEDA looks forward to working with state lawmakers and officials to create additional economic opportunities in Wisconsin. We are also excited to work with members form every corner of the state over the next two years to help advance WEDA’s Legislative Agenda.